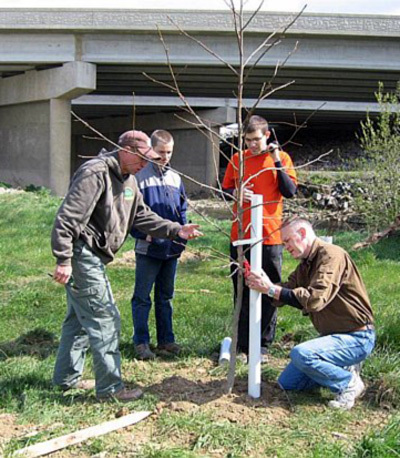 The Opequon Creek Project Team (OCPT) was the recipient of a WV Project CommuniTree kit to plant 150 trees along the Opequon Creek at the Route 9 Bridge in Berkeley County, West Virginia. 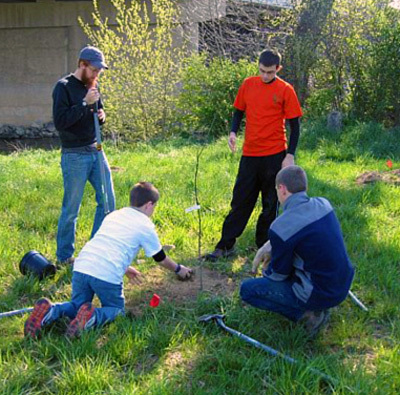 The “Stock Diversity” kit they chose included a diverse mix of 21 riparian tree species in a variety of stock sizes. Lou Scavnicky, President of the OCPT, completed the application and organized the project. 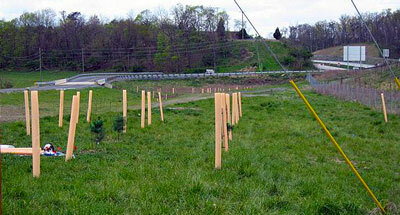 This project was organized by the Opequon Creek Project Team’s President, Lou Scavnicky. 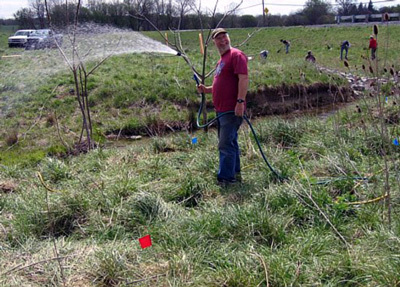 A dedicated and hard-working group of around 12 volunteers planted the 150 trees to create a riparian buffer for the Opequon Creek and the adjacent creek Evans Run. Staff from the Division of Highways in Burlington was in attendance to show their support for the project and assist in the tree planting. 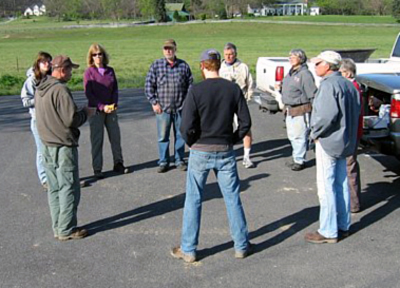 Lou and his group were assisted by CommuniTree Representative Suzy Lucas from the Eastern Panhandle Conservation District. 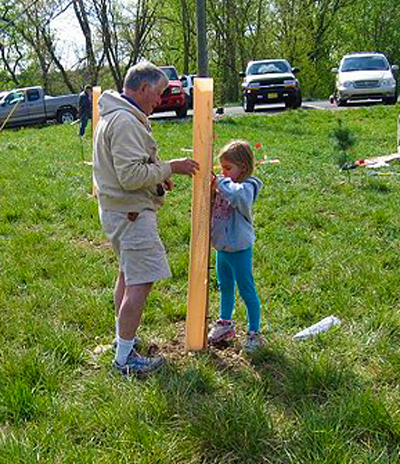 The 150 trees planted at this event serve as a riparian forest buffer, reducing stormwater runoff, and increasing Berkeley County’s urban tree canopy. 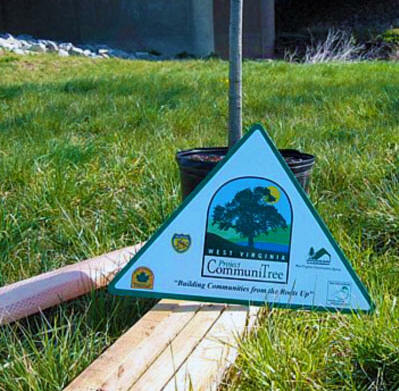 CommuniTree sign with bridge behind. Suzy and Lou auguring holes. CI's Tanner Haid instructing boy scouts on how to plant a tree. Filling in the hole with soil. Gary from the OCPT watering the trees. Herb inspecting the tree before tubing. The finished product. 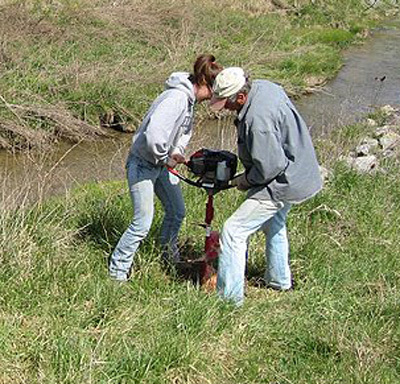 This will become a healthy riparian buffer.